I am not sure about democratic socialism. The sound of that is enough to cause me pause. History has taught us that socialism is a term and political system we all must fear. But, I have no problem agreeing with both Dr. King and the Honorable Mr. Sanders. They are absolutely correct in calling for a better distribution of wealth for all of God’s children. Income inequality in our country continues to grow, and the ever-widening chasm between the obscenely rich and the desperately poor is the most dangerous divide our nation faces. This is a clear and present danger that is actually far more frightening than the term socialism. This entry was posted in Hunger & Poverty, Quotes and tagged America, Bernie Sanders, chasm, children, clear and present danger, democracy, democratic socialism, fear, God, income inequality, Martin Luther King Jr, Norway, poor, rich, wealth on November 9, 2015 by Ray Buchanan. 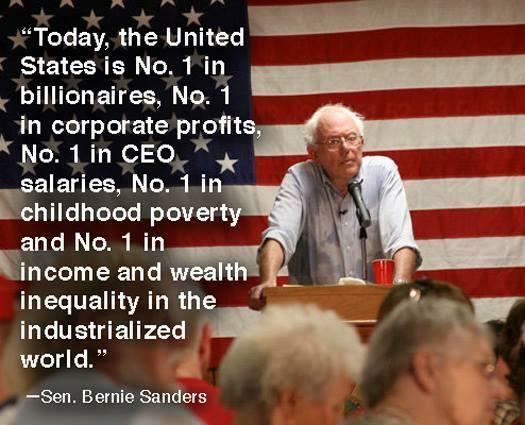 Bernie is absolutely correct on this. Poverty such as this is morally inexcusable in our country. This should be a call to action for all of us, especially people of faith. 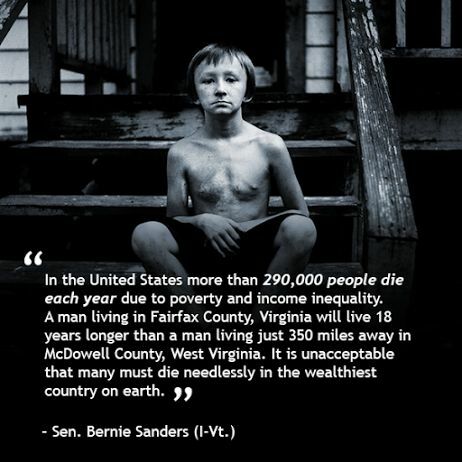 This entry was posted in Hunger & Poverty, News & Views, Quotes and tagged Bernie Sanders, Fairfax VA, income inequality, McDowell County WV, morality, poverty, US, wealth on July 23, 2015 by Ray Buchanan.